Sony Classics presents this entry in the Herbert Von Karajan - His Legacy for Home Video series. 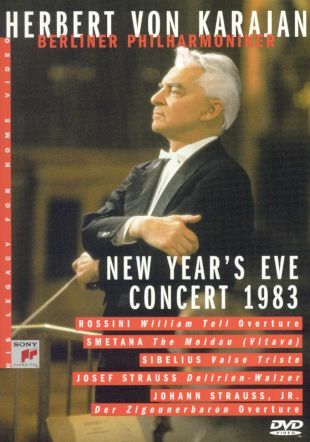 Featuring a performance by conductor Herbert von Karajan and his orchestra, Herbert Von Karajan - His Legacy for Home Video: New Year's Eve Concert 1983 was released in 2001. Other titles in the series include Herbert Von Karajan - His Legacy for Home Video: 1987 Vivaldi - The Four Seasons, Herbert Von Karajan - His Legacy for Home Video: Beethoven Symphony No. 9 - Choral, Herbert Von Karajan - His Legacy for Home Video: The 85th Birthday Celebration, and Herbert Von Karajan - His Legacy for Home Video: Verdi Requiem.